In the annals of business trips gone horribly wrong, Evangeline Harker's journey to Romania on behalf of her employer, the popular television newsmagazine The Hour, deserves pride of place. Sent to Transylvania to scout out a possible story on a notorious Eastern European crime boss named Ion Torgu, she has found the true nature of Torgu's activities to be far more monstrous than anything her young journalist's mind could have imagined. The fact that her employer clearly won't get the segment it was hoping for is soon the very least of her concerns. Back in New York, Evangeline's disappearance causes an uproar at the office and a wave of guilt and recrimination. Then suddenly, several months later, she's heard from: miraculously, she's convalescing in a Transylvania monastery, her memory seemingly scrubbed. But then who was sending e-mails through her account to The Hour employees? And what are those great coffin-like boxes of objects delivered to the office in her name from the Old Country? And why does the show's sound system appear to be infected with some strange virus, an aural bug that coats all recordings in a faint background hiss that sounds like the chanting of...place-names? And what about the rumors that a correspondent has scored an interview with Torgu, here in New York, after all? As a very dark Old World atmosphere deepens in the halls of one of America's most trusted television programs, its employees are forced to confront a threat beyond their wildest imaginings, a threat that makes gossip about an impending corporate shakeup seem very quaint indeed. 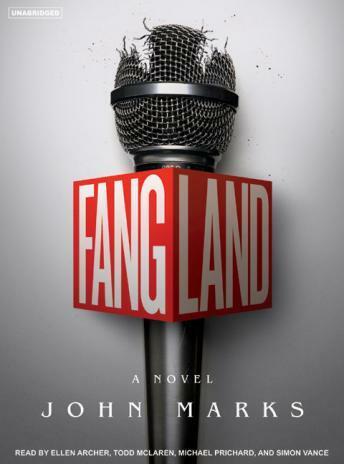 Written in the form of diary entries, e-mails, therapy journals, and other artifacts of early-twenty-first-century American professional-class life, compiled as an informal inquest by a very interested party, Fangland manages both to be a genuinely-in fact triumphantly-frightening vampire novel in the grand tradition and a, yes, biting commentary on the way we live and work now.